Do you like it big, loud and nasty? 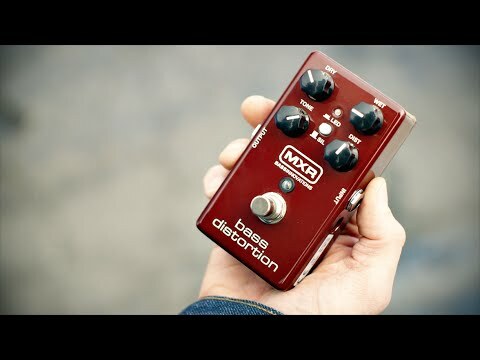 Good because that's exactly what the MXR M85 Bass Distortion effect pedal does! This stompbox will take your bass tone to the next level with huge bass end and 'nasty' distortion! With a separate wet and dry mix you can get the balance exactly right for your sound. There's even a switch to change the type of clipping distortion from Silicon to LED. In the default 'Sil' mode the drive is compressed, biting and aggressive where in the LED mode the sound is more 'wide open' which provides a more gain. You've also got a tone and distortion control which allows you to shape the EQ curve and the amount of filth you want on your sound! Overall this is a seriously great bass drive that will completely change your sound. What an awesome pedal this is! Why not give it a try today! See how it sounds in the video to the left.